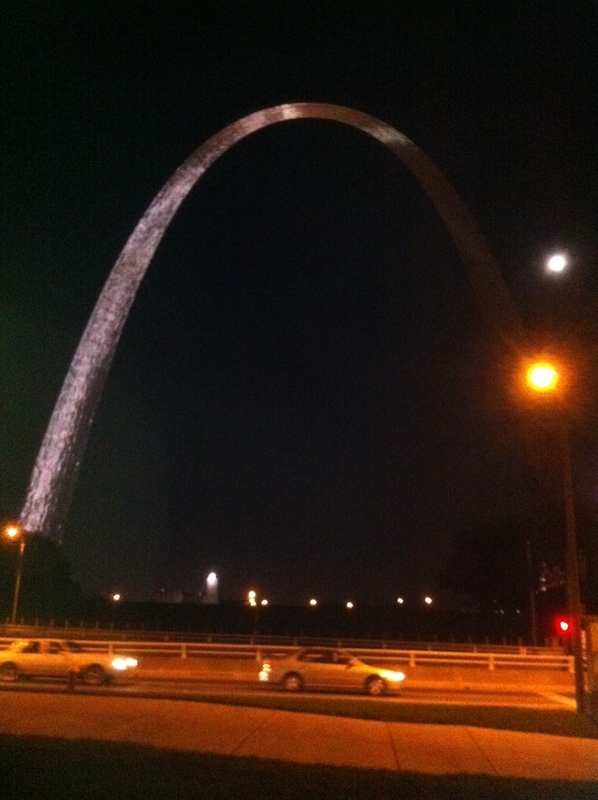 Day 64 of my U2 360 tour across America brought me from Philadelphia to St. Louis, driving almost 900 miles in over 16 hours. It should have only taken about 14 hours, but two traffic jams in Indiana caused my delay. It was much like my drive from Miami to Nashville, actually it was like deja vu. My drive from Anaheim to Baltimore was easier than my drive from Miami to Nashville and from Philadelphia to St. Louis. 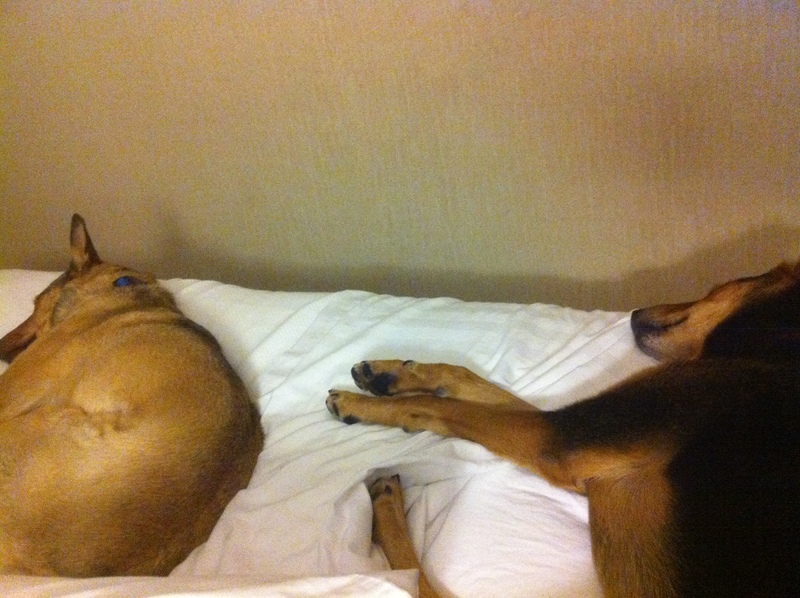 Elvis and Cilla were exhausted! I left Philadelphia just after 6am est driving the Pennsylvania Turnpike – again. I was on that dreaded $20-toll turnpike the week before and two weeks before that, and would be driving it again in a few days and again the following week. Ugh! 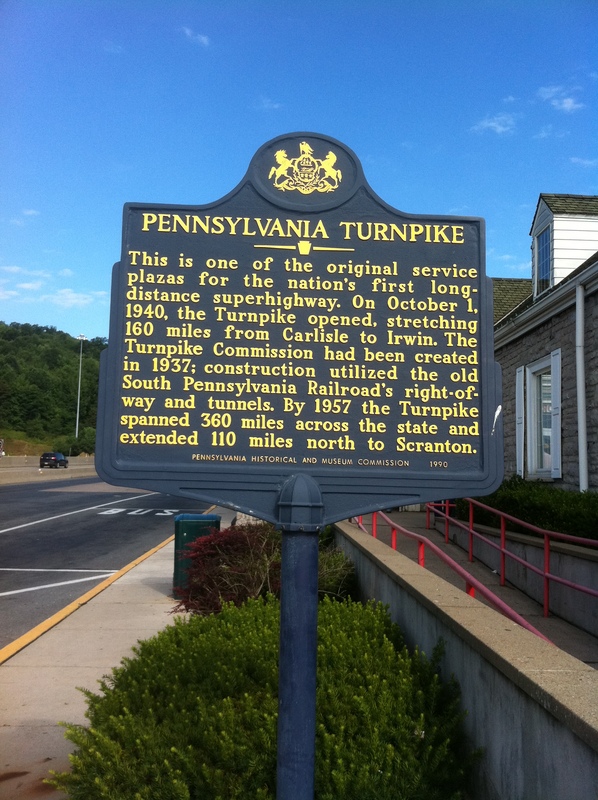 But I did come across a historical marker at the one of the first travel stops on the PA Turnpike, so at least that was something interesting. We stopped four times for gas, food, etc in addition to the two times we were stopped in traffic. Both traffic jams were on Route 70 West in Indiana about two hours apart, which was very frustrating. It was truly Carmageddon everywhere that day in July – the 405 in Southern California was closed, 240 in Memphis was down to one lane, and Route 70 West in Indiana was shut down twice. 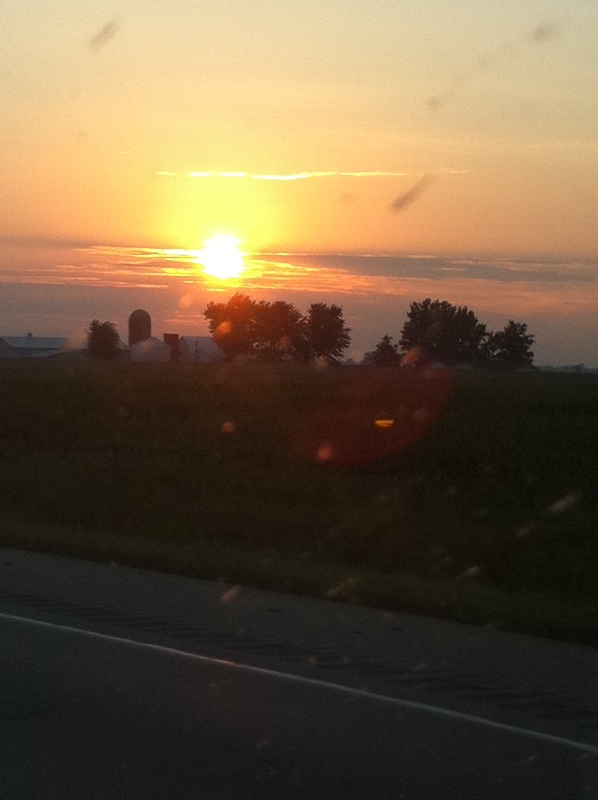 But if I hadn’t been delayed, I wouldn’t have seen the beautiful sunset – there is always good that comes with the bad. 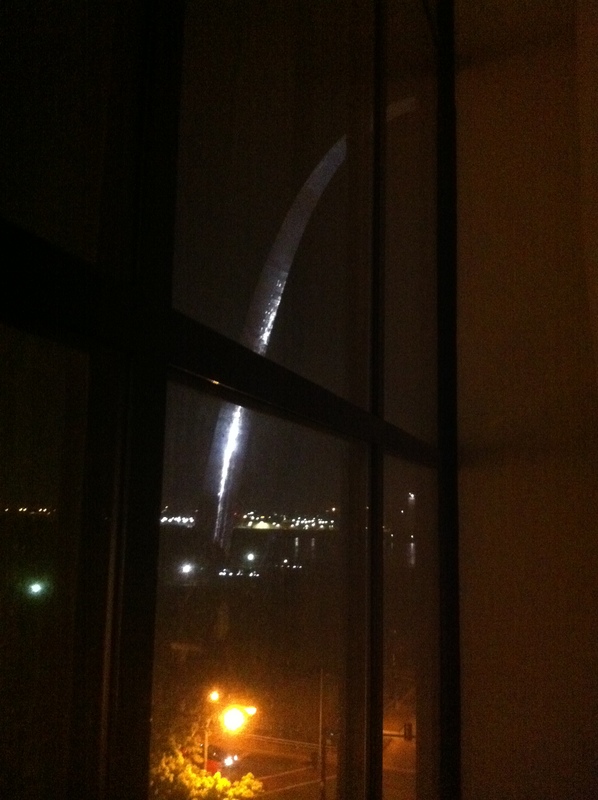 We finally arrived at our great Drury Plaza Hotel in St. Louis just past 9:30pm cst, over 16 hours later. As soon as I walked into the lobby, I realized this was the hotel I stayed at when I visited St. Louis eight years ago when I went to the Orioles-Cardinals game. The staff there was fantastic! They answered my questions immediately and quickly brought me what I needed, as well as checked me in quickly knowing I had a long day. To reward myself for my rough day of driving, I ordered a pizza from Imo’s for a late dinner – ‘an original St. Louis style pizza.’ I didn’t even know there was a ‘St. Louis style’ pizza. 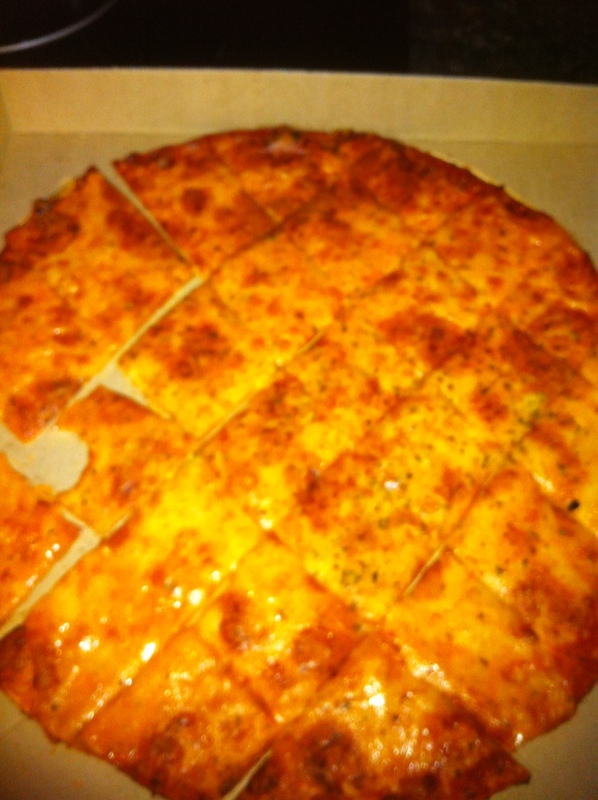 It is very thin crust with provolone cheese, but it tasted like cheddar was mixed in with it. It was no Ledo’s, but it was really good. 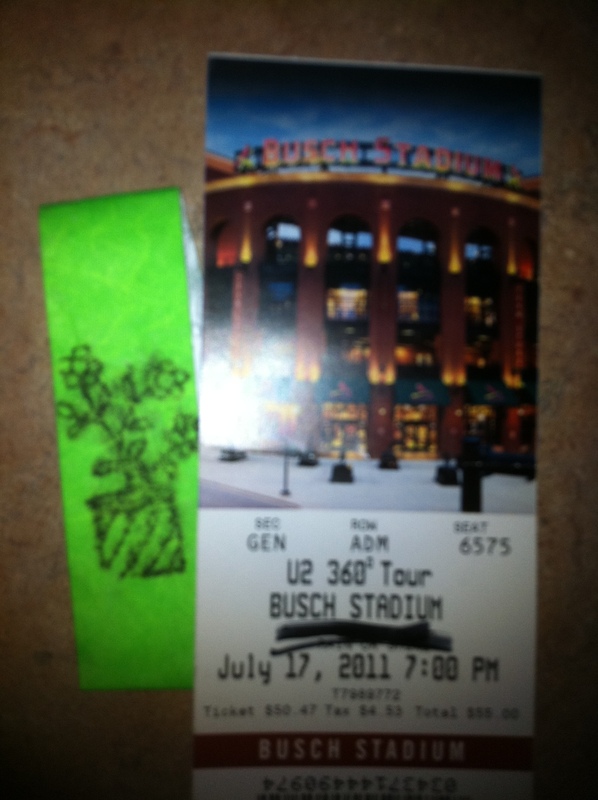 The U2 360 show in St. Louis was amazing! Definitely one of my favorites, along with Chicago and Anaheim2. Even though it was a standard set list, there was no Out of Control or One Tree Hill, the band and the audience had such a great energy. 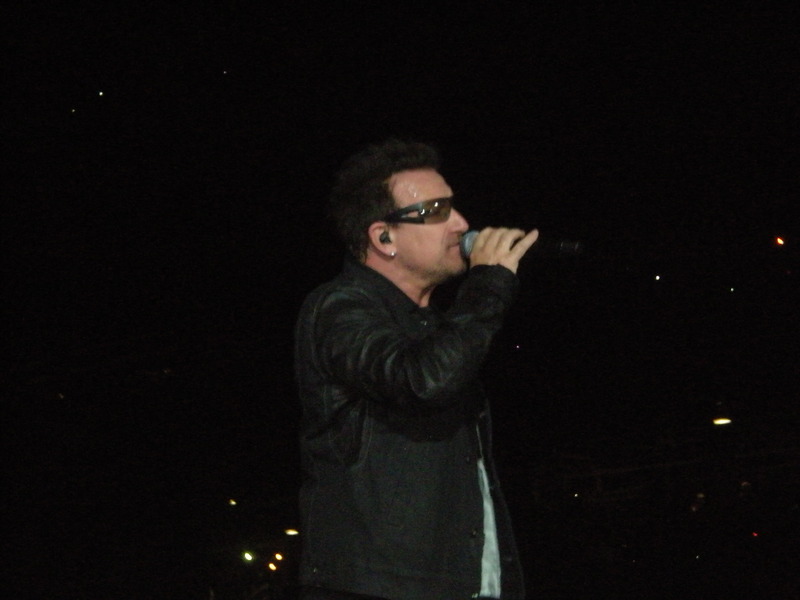 Bono was especially excited – he was really excited and happy. The Fly returned after its brief departure in Philadelphia, and Magnificent disappeared again. For the first time both Bono and Larry acknowledged me on their way onto the stage and then later Bono gave me an indirect ‘shout out’ during the band introductions. 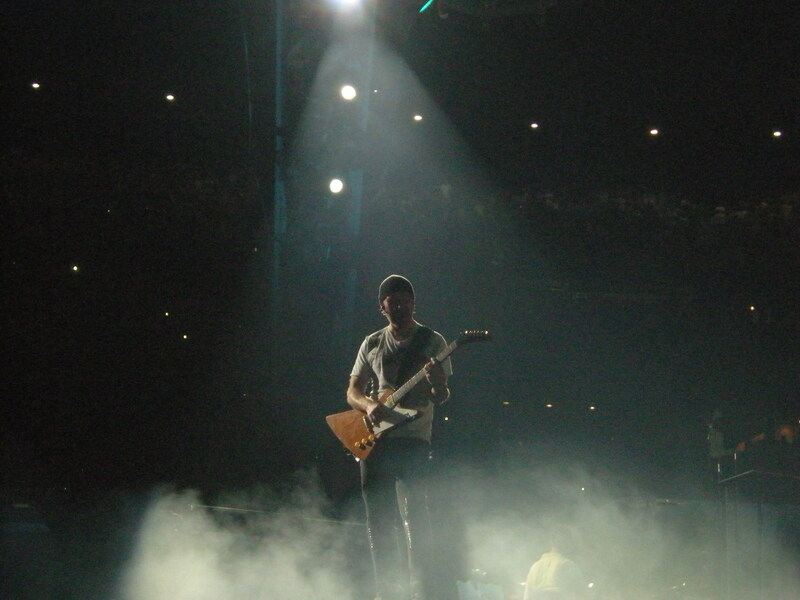 The St. Louis show was the hottest show of the tour, beating Baltimore and Nashville, with its 110 heat index. My friend Beth flew in the morning of the show. We talked the day before as she made last minute plans to come to St. Louis, so we decided that she would share the hotel room with Elvis, Cilla and myself. 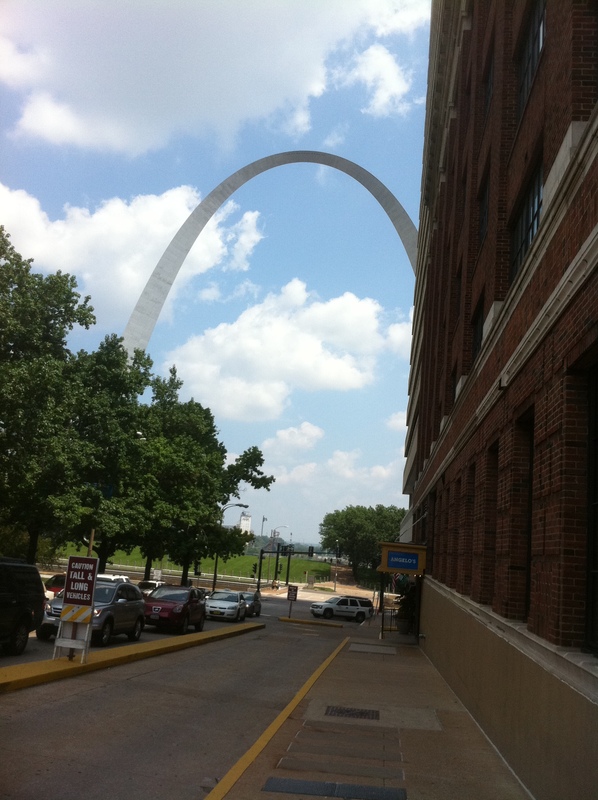 We relaxed in the hotel for a bit, then went to lunch on the way to Busch Stadium, which was only a couple blocks away from our hotel. 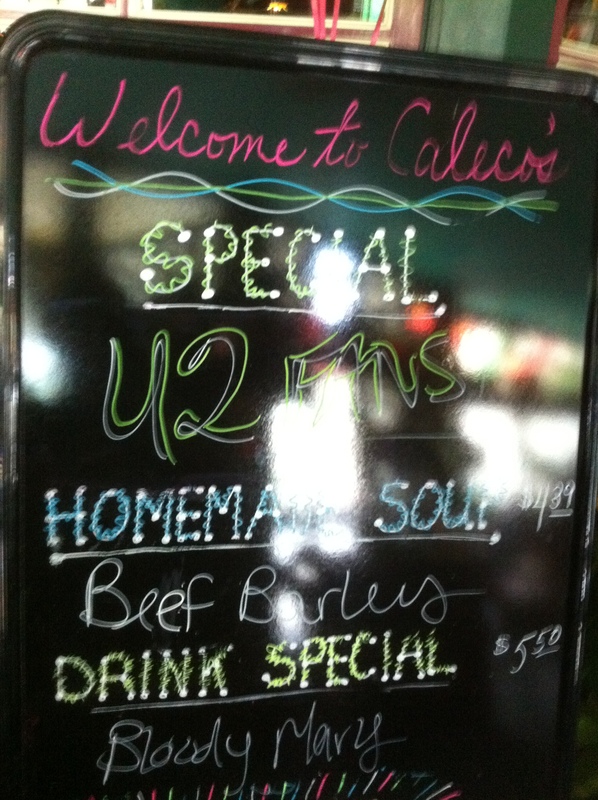 We had a great pasta lunch at Caleco’s thinking we should carb up to sustain the long day in the 110 degree heat! 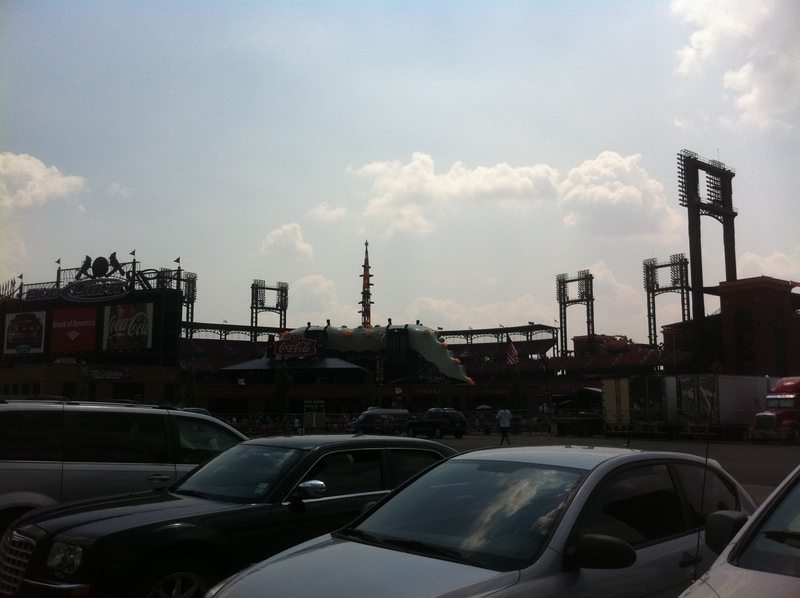 After lunch, we made our way to Busch Stadium to try to figure out where U2 would drive in. Luckily, the spot we chose was in the shade. My friend Chuck and Beth’s friend Tim were there. We also ran into Cathal and a few others. There was a bit of discrepancy where the band was actually going to drive in. There were a lot of people on the other side of the stadium waiting, and only about 10 of us on our side. Turned out we were right and the band drove in just after 5p where we were waiting. 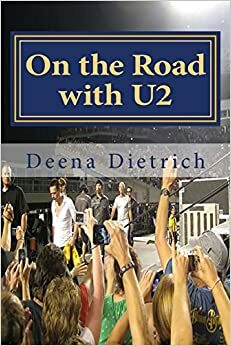 Bono rolled down his window and waved, and Edge and Adam waved from inside their cars. The guy in the fourth car, who I assumed was Larry, didn’t wave or look at us – just looked straight ahead. About 15 minutes or so later, another car drove in and this time it was Larry and he waved. We were surprised when no one came out to greet us, since there were only about 10 of us there. I walked into the stadium and over to the inner circle on Edge’s side, but it was closed. So I had to walk around to Adam’s side, get my stamp for re-entry, then walk back over to Edge’s side. Even though I could see that U2 was going to walk into the stadium from the tunnel on Adam’s side, I wanted to be on Edge’s side so I could watch them walk onto the stage, or under the stage actually. My friend Jason from Memphis joined me. He had contacted me earlier and drove up that afternoon and luckily bought a GA from someone outside the stadium around 6pm. I met a guy and his young son Tyler, I mean like 7 years old young, who had been to 9 shows this tour. Turned out, they read my blog and Tyler’s favorites are Larry and Bono. A guy from the crew asked me how many shows I had been to. When I told him all the US shows that leg and I was driving to all of them with my dogs, he said I was crazy and should just give my money to him. 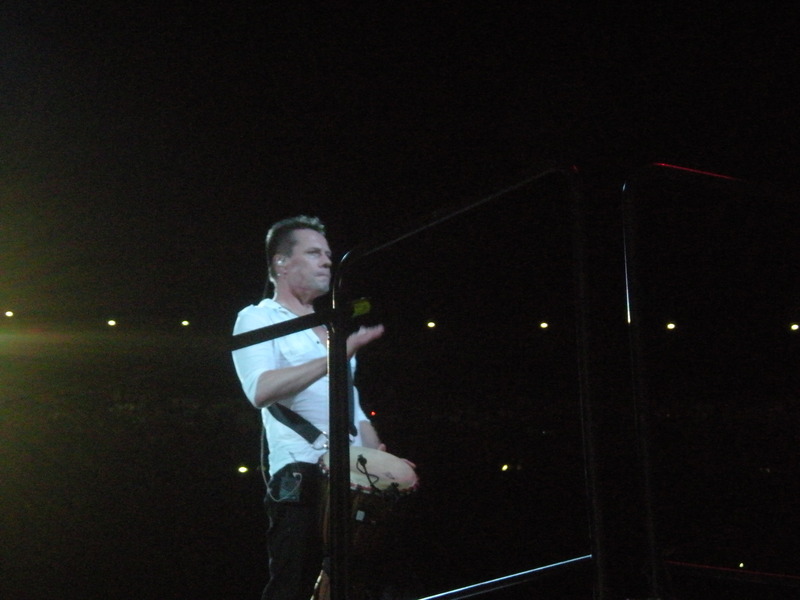 I told him I should work for U2, so I could get paid to follow the tour. Interpol took the stage around 7:30m and played their usual set. I still was not a fan, but they were ok. U2 didn’t come out until about 9:15pm. On the way to the stage, Larry saw me and smiled and waved. And not his usual obligatory smile and wave, but he actually seemed to recognize and acknowledge me. 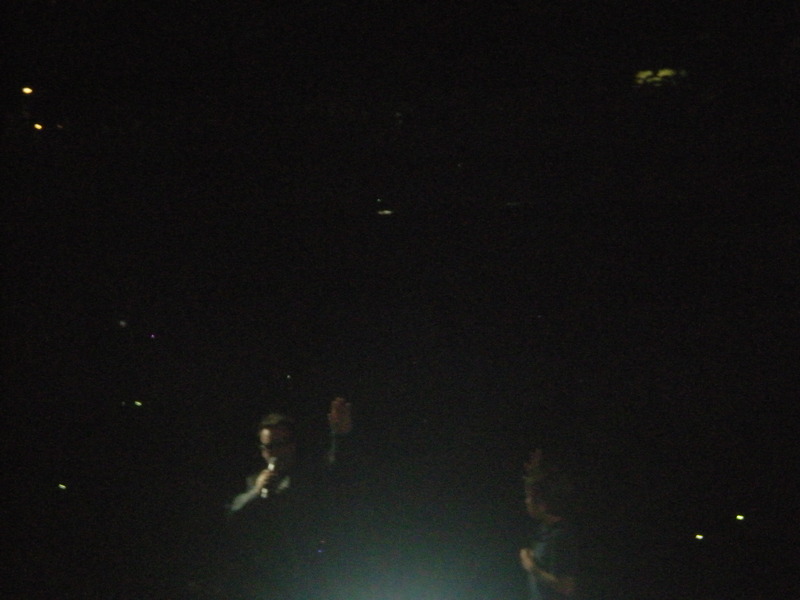 Then Bono smiled, waved and said ‘Hi’ to me. I could definitely see recognition in his face – and it’s been a long time since I spoke with him in Seattle and Oakland. So maybe Bono and Larry were actually waving to me as they drove into the stadium earlier. Or it could have been the fact that I was almost always standing at that same spot where U2 walk onto the stage and always wearing my straw cowboy hat and ‘Larry Mullen Band’ tee. Yeah maybe after 12 shows, they finally recognize me. 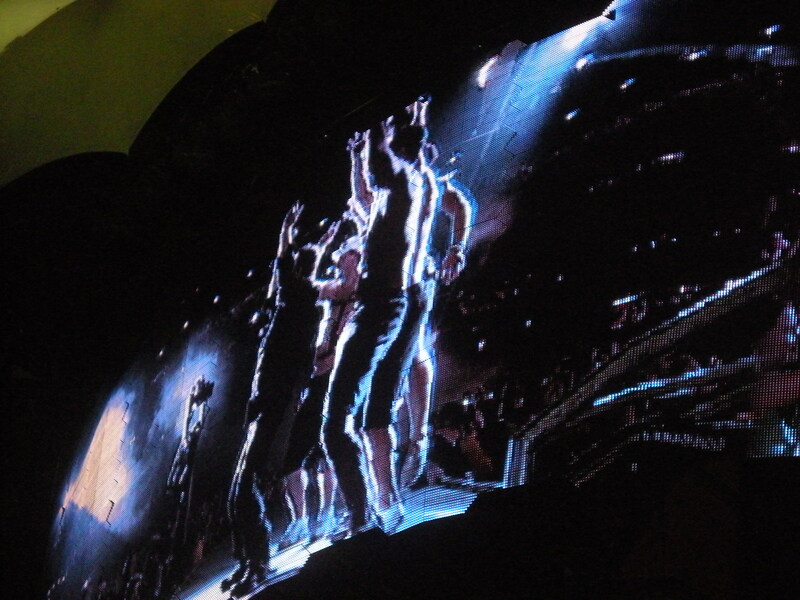 Please watch my video of U2 walking to the stage – it’s a little (a lot) shaky. As if I wasn’t excited enough, or hot enough, from Get on Your Boots, one of my favorite parts of the 360 show, Bono started his usual talk before I Still Haven’t Found What I’m Looking For. He read the set list from a show U2 played in St. Louis 30 years ago. I thought they would play an impromptu old song, especially when everyone cheered when he read Out of Control, but they didn’t. 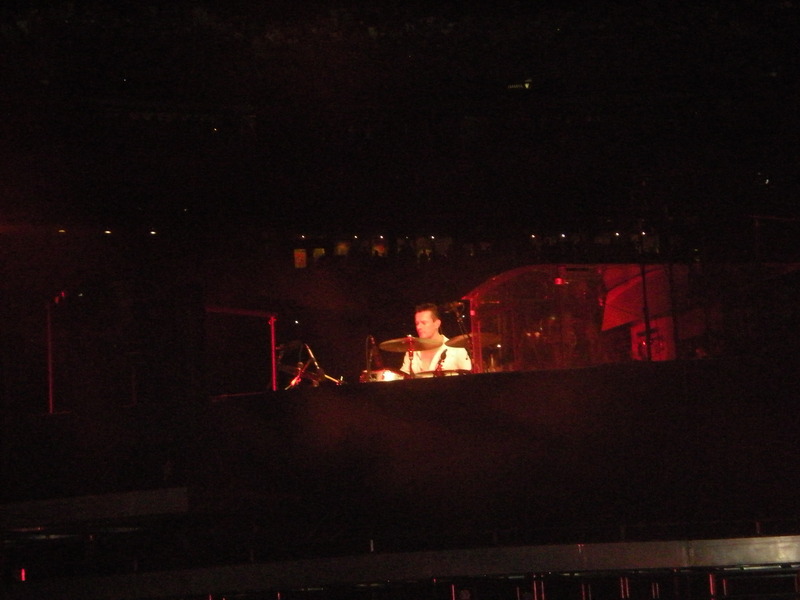 Then Bono started the band introductions. He said, “So much has changed and yet so much remains the same. Larry is still upset about the fact that we changed our name to U2 from the Larry Mullen Band. And there are some people here who agree with him.” With that Larry busted out laughing. Everyone thinks Bono was referring to me, and maybe he was since both he and Larry did clearly notice me on the way to the stage. Please watch my video of Bono’s band introductions. That St. Louis show was so hot and humid that Bono took off his signature jacket during the second or third song and performed in his tee shirt. Then he left Edge to introduce Stay while he went down into the underworld to change his shirt. During Beautiful Day Bono shouted,” Turn the lights on Willie. I want to see these people.” Then during Elevation, Bono brought up some new U2 fans on stage. 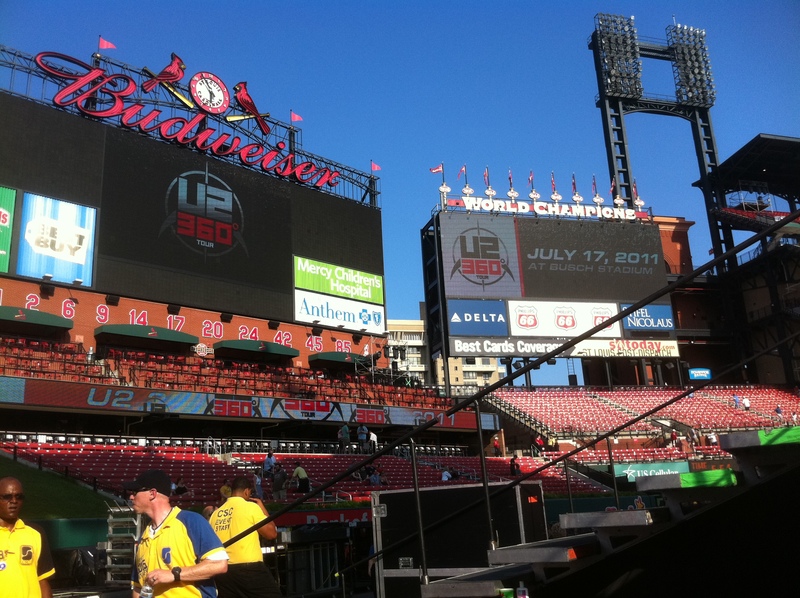 As hot as it was, U2 chose the St. Louis to wear their lighted jackets during Zooropa and City of Blinding Lights. I love Larry in that black jacket (it’s so Elvis), but I can’t believe they chose the hottest show of the tour to wear them. In the past, it had only been at the colder shows. 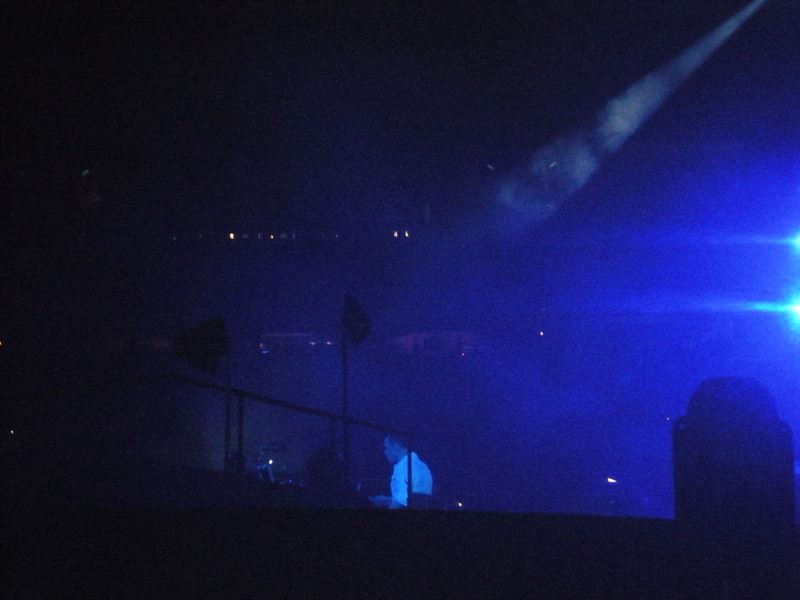 During City of Blinding Lights, Bono brought up a young boy with him to run around the cat walk – again during the hottest show of the tour. 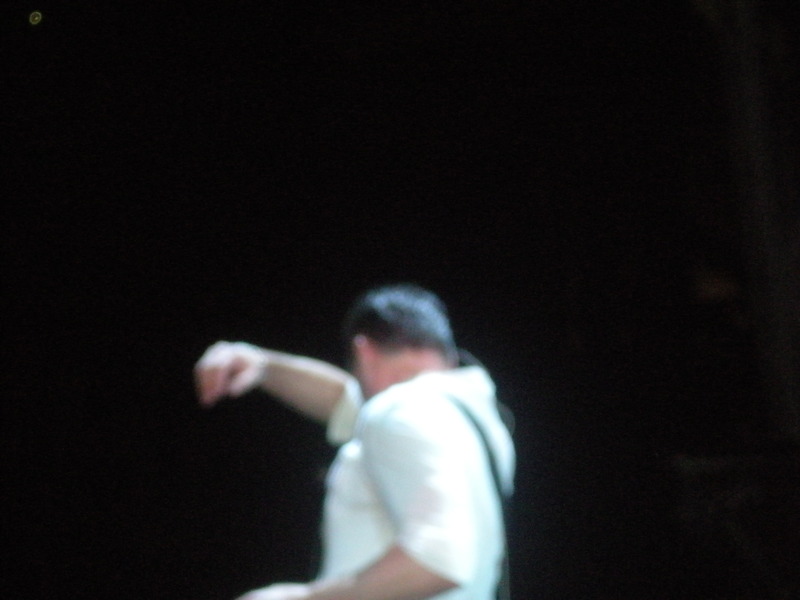 It was so hot that Adam went shirtless under his jacket during I’ll Go Crazy. After watching Larry start I’ll Go Crazy, turn around facing the back during Sunday Bloody Sunday, and his drum solo during Scarlet, I walked around to Adam’s side of the inner circle to watch the rest of the show. Even though I like Edge’s side better, I knew U2 would leave through the tunnel on Adam’s side of the inner circle. As they walked by very quickly, I shouted out to Larry and he waved and smiled, but at my friend Chuck not at me. 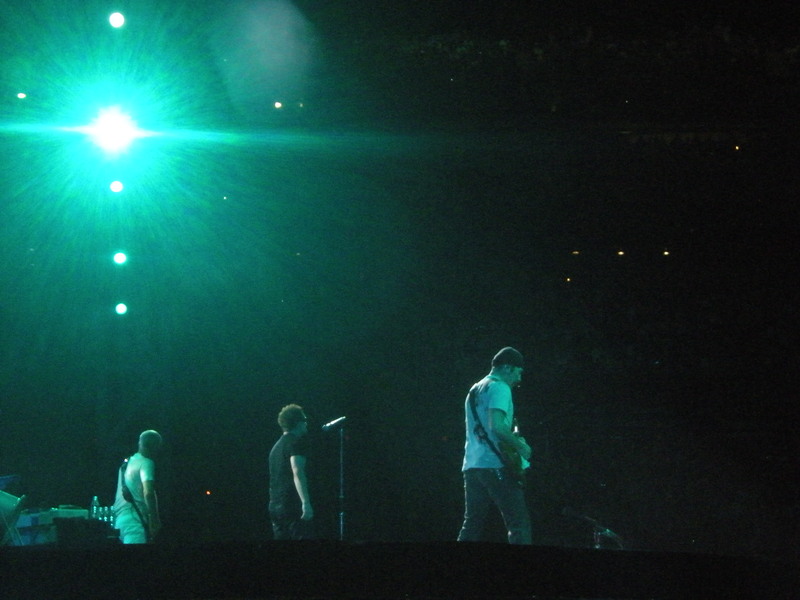 July 17th was the 8th anniversary of my beloved Grandmother’s death, so maybe Grandmom had a hand in making that U2 360 show in St. Louis special for me. It was a great night! A fantastic show! One of my favorites! People who weren’t there have asked me why the St. Louis show was better than the others because there wasn’t anything extraordinary about the set list. It is hard to really put into words unless you were there. It was just a feeling we all had who were at the show. There was an amazing energy that night in St. Louis! The set list from the U2 360 show in St. Louis was as follows: Even Better Than The Real Thing, The Fly, Mysterious Ways, Until the End of the World, I Will Follow, Get On Your Boots, I Still Haven’t Found What I’m Looking For / Many Rivers to Cross, Stay, Beautiful Day / Space Oddity, Elevation, Pride, Miss Sarajevo, Zooropa, City of Blinding Lights, Vertigo, I’ll Go Crazy / Discotheque / Life During Wartime – Psycho Killer, Sunday Bloody Sunday, Scarlet, Walk On, One, Hallelujah / Where the Streets Have No Name, Hold Me Thrill Me Kiss Me Kill Me, With or Without You, Moment of Surrender.